Have you ever gone to a website and left because it looked messy, outdated or unprofessional? If not, you’re in the minority. Prospective customers expect companies they engage with to have a polished look, but it’s not just about aesthetics; it’s about brand trust. A bad logo, inconsistent marketing collateral, and a website that looks like it was designed at the dawn of the Internet, can make customers question the quality of a company’s products and services. It doesn’t matter how awesome your business is if you have bad graphic design. Consumers will often move onto your competitors without calling or emailing you if they feel your brand is untrustworthy. 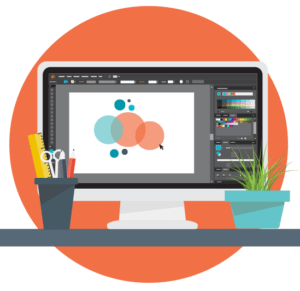 Think of graphic design as the glue that holds every brand together because it spans across all marketing collateral – from business cards and letterhead to websites, social media, and more. If you don’t think your business could achieve a passing grade in the graphic design department, start with your website and look at it as if you were a customer visiting for the first time. Does it look professional? Is it easy to find the information you need? Does it have a modern feel? Now, look at a couple of competitor websites. How does your site compare? If their websites show modern branding, an eye-catching logo, and consistency with other creative collateral – brochures, business cards, email signatures, etc. – and yours doesn’t, it’s time for a refresh. A lot of companies design their own logos or outsource to businesses like Fiverr that can create logos and other materials for as little as $5 USD. But the people doing the designing won’t know your company well. They will simply create a logo based on the instructions you give them. At Curve, we get to know a brand before we start the design process. We look at the products you sell, the feeling you want to convey, your existing reputation and client base, and who you want to attract with your new creative collateral. You play an active role in the process because you know your company best. We’re there to guide you, offer advice, and do the work. Quality graphic design is a long-term investment, but one that can do wonders for your business. resonate with your target audience. Curve has been building brands for more than 15 years. We know what it takes to design unique logos and other collateral to make your company shine. Just as readers judge books by their covers, consumers judge brands by the quality of their graphic design. Let Curve’s design team give you a new cover today. © Copyright 2019 Curve Communications. All Rights Reserved.